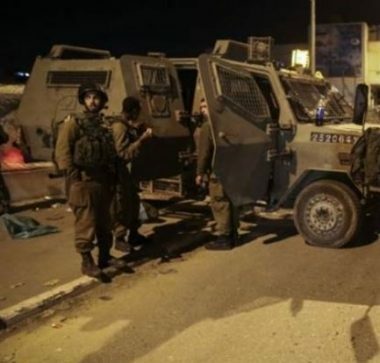 Israeli soldiers invaded, on Friday evening, the Al-Jalazoun refugee camp, north of the central west Bank city of Ramallah, reportedly after shots were fired at Beit El illegal colony. Many youngsters hurled stones at the soldiers while armed resistance fighters exchanged fire with the invading forces. Media sources in Ramallah said dozens of soldiers invaded the refugee camp after many live rounds were fired at Beit El nearby illegal colony and military base, which was built on Palestinian lands. Following the invasion, many local youngsters hurled stones and Molotov cocktails at the army jeeps, while the soldiers fired more live founds, rubber-coated steel bullets and gas bombs. The army also invaded a gas station to confiscate surveillance recordings, while local youngsters hurled stones at them, before additional forces invaded the area and fired dozens of live rounds to secure the retreat of the soldiers. During the invasion into the Gas Station, the soldiers caused excessive damage, and confiscated several computers and surveillance equipment.